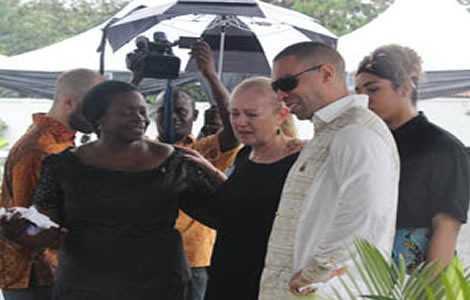 Days after arriving in Ghana to bury his father, Joey Ansah son of renowned fashion designer, Kofi Ansah has released a top-notch Hollywood movie. The movie titled ‘Street Fighter: Assassin’s Fist’ is based on the popular video game series Street Fighter by Capcom. ‘Street Fighter: Assassin’s Fist,’ a martial art movie created, written and directed by Joey Ansah, was released on May 31. Joey Ansah happens to be the second of three children of the late ace fashion designer Kofi Ansah. He was born in London to Kofi Ansah and his Devon-born mother Nicola. He lived in London for the first 10 years of his life before moving to Ghana with his family. While in Ghana, Joey studied the martial art of Tae Kwon Do for four years. At age 15, he returned to England, settling with his mother and young sister. As a marital artist, actor, producer and director, Joey has starred in various Hollywood movies including ‘Bourne Ultimatum’, ‘Snow White and the Huntsman’ and ‘Attack The Block’ among others. He was in Ghana for the final funeral and memorial service for his father Kofi Ansah on Friday May 30. Joey wept uncontrollably as he filled pass the mortal remains of the award winning fashion designer. Kofi Ansah died at age 62 on May 3 this year, at the Korle-Bu Teaching Hospital in Accra. Joey Ansah, the rest of the family and the world will forever miss the great designer.